Deputy Director Lorraine Fraser King graduated from Flinders University of South Australia with a degree in Education. She worked with her then husband Dr. Hilary King in epidemiological field surveys of diabetes and hypertension in the 1980s. She came to Cambodia in 2009 to help Prof. Keuky set up the clinic and has worked as a volunteer for four years. Dr. Deourn was born in Battambang Province and studied medicine in University of Health Sciences in Phnom Penh. He decided to specialise in diabetes when his father died from diabetes complications. He began working in the diabetes clinic in Battambang Referral Hospital in 2007 and came to CDA SRB in 2012. He enjoys cycling, playing soccer and kick boxing and speaks English, French and Khmer. Ien Serey Horn was born in Kompong Thom, studied economics at Western International University. She graduated in 2008 and began working with CDA SRB in 2010. Not only is she Prof. Keuky's personal assistant but she is in charge of ensuring everything is working and in order in and outside the clinic. She loves cooking and enjoys her work helping to keep poor people healthy. Boreth was born in Dom Daek, Soth Nikum District. He studied general management at Angkor University, Siem Reap. After graduating in 2010 he worked as a credit officer with a micro financing company. He came to work for CDA SRB in 2011 and is not only the accountant but is the leader of a mobile clinic which goes to his home town and other villages every month. He plays soccer, likes listening to music - Khmer and international - and enjoys going out with his friends. Serey Net was born in Siem Reap and studied nursing at the University of Health Sciences in Phnom Penh. When she graduated in 2012, she started work in a clinic in Phnom Penh. But she decided to come back to her home town and began working with CDA SRB in 2013. She enjoys cooking traditional Khmer food, swimming, listening to music and watching TV. Kong is originally from Battambang but came to Siem Reap to study at Build Bright University. He lives with his wife and two children and as well as working part-time on CDA SRB's education programme, he teaches at his old university and is studying for his Masters Degree in education. Despite all of these comittments he still finds time to go fishing, take his family on picnics and to go out with his friends. Thana was born in Bakong district. Every day she and her husband come into Siem Reap by motorbike to work. She can be heard singing while she tends the plants in the garden. Her favourite pastime is cooking for her two lovely daughters and her husband. Seng was born in Dom Daek. He studied IT at Angkor University where he met Boreth. His computer is not only his work but also his hobby, however, he does sometimes tear himself away from the computer screen to go karaoke-ing. 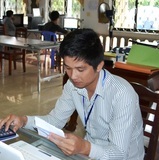 Savun was born in Svay village near Siem Reap and studied nursing in Siem Reap and started work in 2010. She began working for CDA SRB in 2013. She likes to read books, watch TV and enjoys going to karaoke with her friends.